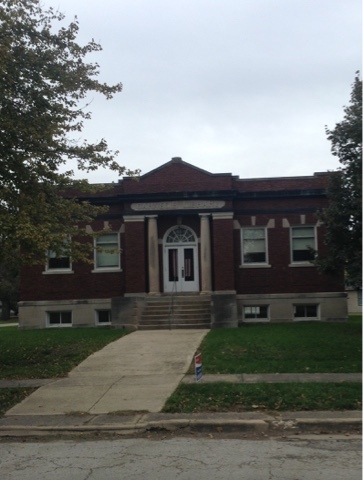 No matter which of the still standing 93 of the 111 Carnegie Libraries built in Illinois happened to be the last one that I got to, it would have been a fitting finale. And so it was with the presently vacant library in the virtual ghost town of DeLand, population just 428, about one hundred less than when the library was built in 1911. Though it may not be in use, it still stands gallantly in this small farming community near the center of the state between the capital, Springfield, and the large university town of Champaign-Urbana. It is a town of empty stores, the lone hold out an antique shop, plus one of those ubiquitous Casey's General Stores outside of town on highway 10 that leads to Champaign-Urbana, twenty-two miles away. The Carnegie faced a large park. It wasn't in the grand-edifice school of Carnegies, such as the domed one in Paxton forty-five miles to the north that is on the cover of the book on the Carnegies of Illinois, but an example of the more common non-ostentatious, dignified model with a pair of pillars, high windows, steps up to the entrance and a light fixture symbolizing enlightenment. It had the added flourish of a curved slice of stained glass window over the entry featuring an open book promising worlds of knowledge within. It was constructed of red brick. High above the entry Carnegie Library was spelled out in bold capital letters. It exuded no less majesty than any other. It has been a glorious quest over the years visiting all the Carnegies in the state. This final push seeking out the last 25 in the past month was an unexpected bonus bike ride, something I happened to stumble into after biking 1,700 miles from Telluride to Bloomington, Indiana. I only intended to add the nine Carnegies on my route across the state from St. Louis to Bloomington to my repertoire, but then the irresistible fall weather enticed me to continue riding around the state, literally up to the top of the state in Galena and then four hundred miles south down to Metropolis via all the Carnegies I had missed in previous trips. October is such a fine month for cycling it should be renamed Biketober. This has been such a fabulous ride around the state I will have to make this an annual Biketober event in other states. 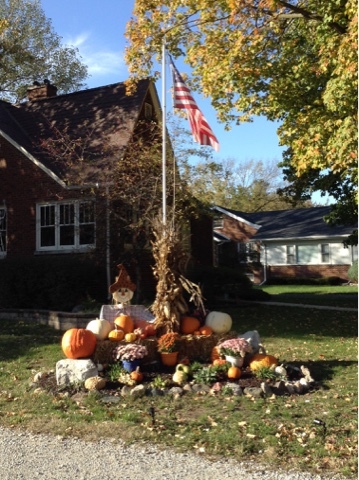 Illinois may not be known for its fall foliage, but all over communities had pumpkins and their cousins on prominent display adding flourish to the season. This ride has been so exhilarating, it is impossible to give it up, even if the semi-wintry weather is trying to tell me to be done with it. 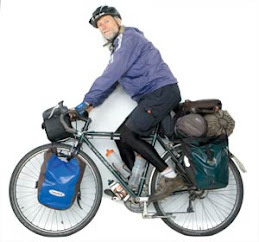 Rather than heading home in glory, I'll extend my ride another five hundred miles or so over to Indiana and put a final bow on it with the possibility of another twenty-five or so Carnegies in the northern part of the state. With fifty more Carnegies than Illinois in a smaller area (Illinois is the 25th largest state, Indiana 38th) they are much more densely packed. And then maybe next October I'll circle around Indiana finishing off the rest. Having cycled over fifteen hundred miles around Illinois on this trip, I have seen a lot of corn. 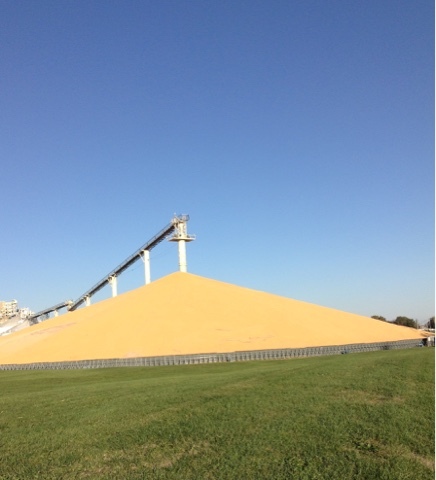 The road has been sprinkled with kernels that have fallen out of trucks transporting it to the silos where it is stored, sometimes piling it in towering pyramids awaiting its fate. Much as Illinois produces, it only ranks fourth among the states. Iowa is number one, followed by Minnesota and then Nebraska, the Cornhusker State. Illinois is truly the Land of Lincoln. Streets are named for him and statues erected and plaques mounted noting his having practiced law or given a speech or visited a place. Outside the town of Monticello, eight miles south of DeLand, a plaque stated that Lincoln and Douglas had met there to arrange their series of debates. Monticello had no need of funds from Carnegie for a library, as a local businessman had donated money for a library before Carnegie began his epic philanthropic endeavor. It had recently been replaced by a large library a couple miles out of town in a suburban-style housing development. When I asked a guy in a pickup where it was, he said it was too complicated to explain and to follow him. The town was plastered with signs exhorting the Sages, as the high school teams are known. Their actual mascot is the owl, but Sages is their preferred nickname. That was as original as the Pretzels of Freeport and Missiles of Milledgeville, other towns whose acquaintance I had made in my circuit of the state. Though I have crossed the state numerous times at the beginning or end of a tour, this has been my deepest and most satisfying immersion. I will have to do it again. Though it is just one fifth the size of France, there is much to see. Just as I never tire of France, I can say the same of prowling around my home state. As with France, it is always a happy occasion to return to a place I've been before to get to know it a little better and to remember my previous visit. Unlike France, there is not much climbing in Illinois. There is only a 955 foot difference between its highest point up along the Wisconsin border near Galena and its lowest point at the confluence of the Mississippi and Ohio Rivers, both of which I came near to on this ride. Only six states have a smaller differential--Indiana with 937 feet, Rhode Island 811, Mississippi 807, Louisiana 543, Delaware 447 and Florida 345. I have been delighted by all sorts of fascinating local lore, particularly the pride a town takes in the visit of someone of note, whether Abraham Lincoln or one of the Beatles. It has been interesting to learn of albino squirrels and Statues of Liberty donated by the Boy Scouts and early industries of pretzels and candy and more on the Lincoln-Douglas debates and the hometown of Superman. I'm ever wondering what oddity I will come upon next, whether it be a sculpture honoring hippies or a statute of Ronald Reagan with a palm-full of corn. But I am mostly reveling in the anticipation of the next Carnegie, knowing its majesty will send my spirit soaring. I am grateful to each for leading me along the roads I have followed. My ever-present, over-riding satisfaction though is the undiluted pleasure of pedaling for hours and hours gazing on the ever unraveling countryside. I am ever feeling supremely privileged that I discovered this as my calling and that I am not quarantined in some room, even if it were with an exceptional book or immersed in an exemplary movie. I want to be out and about. I am a physical being and don't wish to be sedentary. I don't mind though, in fact look forward to, my end of the day quarantine in my cozy cocoon of a tent. I always feel a thrill when I have found my nook for the night and begin setting up my tent and can settle in for an evening of digesting food and my glorious day. Two nights ago I thought I would be camping behind an isolated barn, but as I began to erect my abode for the night I discovered there was a nearby side road that I could be seen from. I didn't feel remorse or frustration, but rather the confidence that something even better awaited me. I went down the road another couple miles after the sun had dipped below the horizon until I came to a small warehouse beside a train tracks that I could camp behind. As the dark settled and I retreated within, I could well have been in some isolated wilderness.